Last week, on the day after Passover, the United States Supreme Court heard arguments in a case with enormous implications for religious liberty and the fair treatment of houses of worship and religious schools in government programs.While we await the high court’s ruling in the case, we are proud that we already know that our advocacy impacted how the justices are thinking about the case and its discussion in the public square – because the legal brief we filed in the case was explicitly quoted at the argument session by a Supreme Court justice. The case – Trinity Lutheran Church v. Comer – involves a Missouri church that applied for funding under a state program that reimburses groups or schools that want to resurface their playgrounds with rubber tire mulch to make them safer. Though the program is secular, the state cited its constitution’s “Blaine Amendment,” to claim no public playground money could flow to a religious institution. Blaine Amendments were adopted in the 1800s by many states during a wave of anti-Catholic sentiment. These state constitutional provisions contain more explicit and restrictive prohibitions against state aid to religious institutions than that contained in the First Amendment of the U.S. Constitution. Thus, even though rulings by the U.S. Supreme Court have permitted government aid to religious schools and other institutions so long as the aid is serving a secular purpose and is awarded on the basis of religion-neutral criteria, opponents to such programs on the state level have invoked Blaine Amendments to thwart such programs in state courts. That’s what makes this case so important. 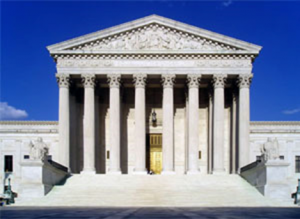 Trinity Lutheran v. Comer is a historic opportunity for the Supreme Court to clearly rule that the federal and state constitutions must ensure that religious institutions are not discriminated against in government programs. The OU Advocacy Center has worked for decades in the legislative arena to deliver important and impactful government aid to our community’s synagogues and schools in appropriate and legal ways. Foremost among these programs is the federal Nonprofit Security Grant Program under which the Dept. of Homeland Security awards funds to help keep our shuls and schools safe. In recent years, we have replicated this multi-million-dollar program with complementary security aid from state and local governments. Based on this work, we are intimately familiar with these programs. We decided to file a “friend of the court” legal brief in the Trinity Lutheran case to impress upon the justices the real-world implications of this case – beyond the confines of a playground in Missouri. Read the full brief here. 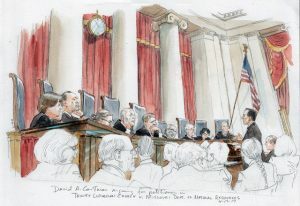 JUSTICE ALITO: Well, Mr. Layton….I just wanted to ask you about some Federal laws that are highlighted in the amicus brief filed by the Union of Orthodox Jewish Congregations, and get your reaction whether a program like that would be permissible under the Missouri constitution. So one of them is a Federal nonprofit security grant program providing grants through the Department of Homeland Security to harden — harden nonprofit organization facilities that are deemed to be at high risk for terrorist attacks. So if you have a –a synagogue that is at high risk for an attack by an anti-Semitic group or a mosque that is considered to be at high risk for attack by an anti-Muslim group, would the Missouri constitution permit the erection of bollards like we have around the court here? MR. LAYTON: The answer traditionally — and I’m not sure that I can speak for the current governor — of course, I was brought back to argue this case and instructed I could defend the prior position, but the answer traditionally would be no. State money could not be used to actually erect or — or operate or provide that kind of physical addition to a — to a church or synagogue. JUSTICE ALITO: Okay…This is a New York City program that provides security –money for security enhancements at schools where there’s fear of shooting or other school violence. MR. LAYTON: Again, under the traditional view in Missouri, if –if this was actually a cash grant, money leaving the public treasury to go to a church, it would not be permissible. We anticipate the Supreme Court will issue its ruling in this historic case at the end of June.